John Sexton Productions, Michael Edgley International. 1983. Director: Simon Wincer. Music: Bruce Rowland. LP	(ST)	EMI. EMX-124. 1983. Gatefold. Composed and Arranged by Bruce Rowland. Conducted and Produced by Bruce Rowland. Engineered by Roger Savage and Martin Pullen. Mixed at Flagstaff Studios by Ern Rose. Recorded at Flagstaff and AAV Studios, Melbourne. All titles Castle. 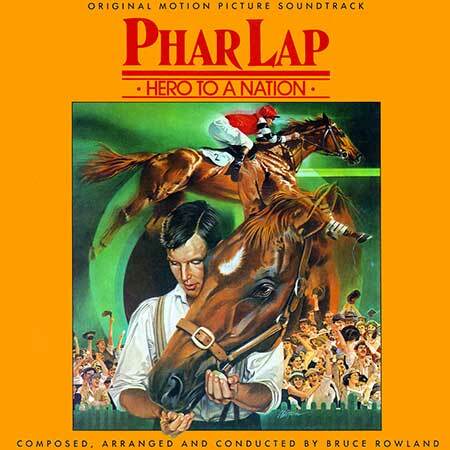 Phar Lap - Main Theme. (2:20). Phar Lap Wins The Melbourne Cup. (2:16). Hero To A Nation. (2:17). First Past The Post. (1:06). Training - The Desert. (1:10). The Richest Race In History. (2:14). 45	(ST)	EMI. EMI-1037. 1983. 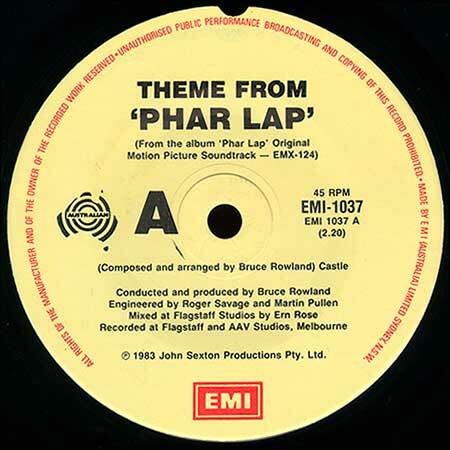 Side a: “Theme From ‘Phar Lap’”. (2:20). Composed and arranged by Bruce Rowland. (Castle). Side b: “Hero to a Nation”. (2:17). Composed and arranged by Bruce Rowland. (Castle). LP(t) (OP) (See COMPILATIONS - PIANO BY REQUEST - BRUCE ROWLAND: S1-Tk7). LP(t) (AD) (See COMPILATIONS - I LOVE AUSTRALIAN MOVIES: S1-Tk1). CA(t) (AD) (See COMPILATIONS - RODNEY CLARKE PLAYS AUSTRALIANA: S2-Tk3).